Swaziland coaches practicing with the varsity soccer team from C.D. Hylton High School. 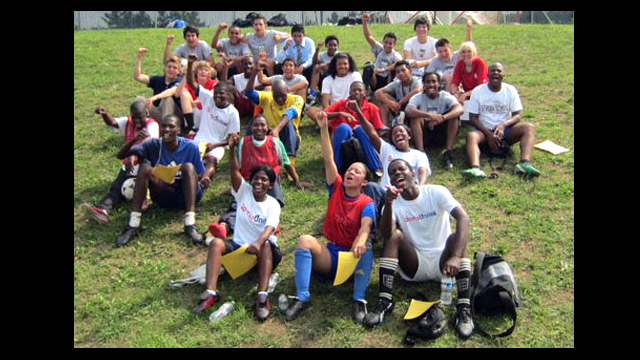 Swaziland Soccer Coach working with a TopSoccer Athlete in Arlington, VA.
Swaziland coaches and members of the Hylton High School Boys Varsity Soccer Team celebrate with a group photo after a tough workout. 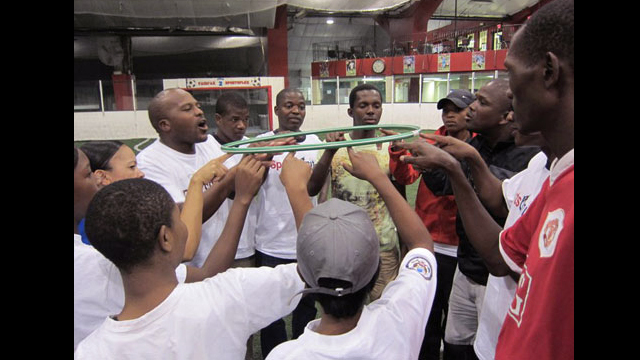 The coaches took part in a customized team-building workshop to strengthen bonds on and off the field. Swaziland participants posing in front of the White House for their first visit. Working with the U.S. Embassy in Mbabane, the Bureau of Educational and Cultural Affairs hosted 12 coaches for a two-week soccer program, involving skills clinics, sessions on disability and sports, conflict resolution, and the importance of self-discipline for success in athletics, academics and life.